After a much needed post-Negev shower and a restful free weekend with friends and family, we met back up in Jerusalem. That afternoon, we gave back to the community by painting a boarding school in Abu Gosh for kids with unsafe homes. 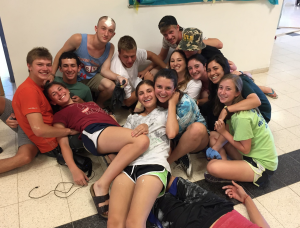 After covering the walls, and each other, in paint, we returned to Jerusalem to shower and hear a few speakers. First, we received an overview of the Israeli-Palestinian conflict. Then, we were fortunate enough to meet with a Palestinian peace activist named Yisam who revealed the deleterious actions of Hamas. After familiarizing ourselves with friendly bedbugs at Beit Shmuel, we encountered an even friendlier staff at the breakfast bar. We then began our powerful day at Yad Vashem, Israel’s holocaust museum. Later that night we watched a documentary about descendants of Nazi leaders, giving us a new perspective on post-Nazi Germany. Tuesday was filled with Israeli politics. First, we visited the menorah and had a tour of the Knesset. That afternoon, we met with 3 speakers: a journalist, a former Knesset member, and of course, the omnipresent Yitzchak who, while trying to show us the power of media, struggled to use his own computer. We had fun at the Malcha mall that evening until we were graciously escorted from the mall after attempting an obstreperous flash mob for Natan’s birthday. On Wednesday morning, we traveled up north along the Western coast, touring the Atlit immigration camp and partying with teens at the Yemin Orde youth village. We spent the afternoon at Achziv beach and while Tanner encountered a jelly fish and Fisher and Zackin slyly joined an official Druze Boy Scouts ceremony. Our night time talent show was highlighted by Zackin’s burping of the ABCs, Melissa’s performance of “Take Me to Church,” and our counselors’ dental hygiene. We camped out alongside Israeli soldiers with whom we played frisbee. We woke up to yoga on the beach and then headed to the old city of Akko, where we visited one of the biggest mosques in Israel and a beautiful Tunisian shul. Unfortunately, Mitchell felt ill, but after a quick meeting with the Otorhinolaryngologist he returned to us rejuvenated. We were treated to a delicious Druze dinner in Piki’in after meeting with Margalit, a woman whose family had been in the city since the destruction of the second temple. Four ebullient members of Na’aleh woke up at 1:30 am to watch Zimriyah and stayed up until 5:00. Mazel tov Ma’alot on the big win last night! Today we are meeting with an Immam and learning of coexistence in Haifa. We are celebrating Shabbat with host families in Elkanah, our madricha Adi’s hometown. Wishing everyone a great last Shabbat of first month!